Space, light and style in abundance. This apartment is fabulous. The quality of build is excellent and includes high ceilings, oak floors and doors, high gloss kitchen units and fully tiled bathrooms making these apartments highly sought-after. The vendors of 203 have further enhanced the property with attractive decor throughout. You really only need move in and hang your hat! 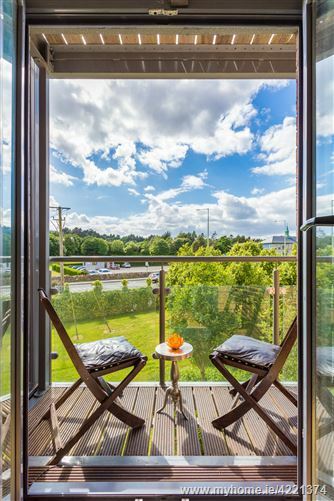 The location is perfect for access to the city centre, UCD, Dundrum and the N11/M50 with easy access north and south by car, bus or luas. The central hallway contains a large storage cupboard, a fine family bathroom with bath, shower, w.c and w.h.b. To the right is an exceptionally bright and sunny livingroom with fantastic views from inside and out on the generous balcony. A light-filled hall leads to the dining room and fully fitted kitchen complete with integrated appliances. To the left are two large double rooms with plenty of built-in wardrobes and the master is en-suite. The grounds are very well maintained as are the common areas. There is ample underground and surface parking. Viewing is highly recommended as this apartment will surely be snapped up.